WASHINGTON -- The United States said Monday in response to the two Koreas' preparations to open a joint liaison office that inter-Korean ties must advance together with Pyongyang's denuclearization. The office is expected to be installed in the North Korean border city of Kaesong to facilitate cross-border exchanges following a historic summit between South Korean President Moon Jae-in and North Korean leader Kim Jong-un in April. A Korean news report cited a US official as raising concerns that South Korea's provision of electricity and other supplies to the office could be in breach of United Nations and US sanctions against the regime. "We are aware that the ROK and DPRK plan to open a joint liaison office in Kaesong," a State Department spokesperson said in response to a Yonhap query, referring to South and North Korea by their respective formal names -- Republic of Korea and the Democratic People's Republic of Korea. The official did not comment on whether the project would be in violation of sanctions, but underscored the need to keep inter-Korean relations and denuclearization moving on parallel tracks. The US has insisted that sanctions on Pyongyang stay in force until the regime completely dismantles its nuclear weapons and ballistic missile programs. "We reaffirmed the Panmunjom Declaration during the Singapore Summit and we did so because progress on inter-Korean relations must happen in lockstep with progress on denuclearization," the spokesperson said. 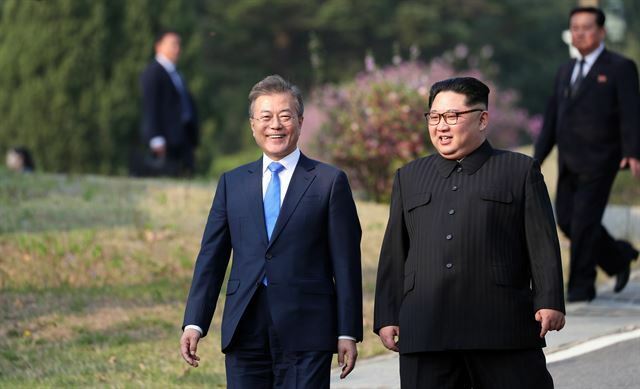 The Panmunjom Declaration, which was adopted by Moon and Kim after their summit, committed the two sides to improve relations and halt all hostile acts through the opening of the liaison office, among other things. In June US President Donald Trump and Kim held their own historic meeting in Singapore and incorporated the Panmunjom Declaration into a separate joint statement. "As President Moon has stated, 'The improvement of relations between North and South Korea cannot advance separately from resolving North Korea's nuclear program," the spokesperson added.